Half-Life Anti-Climax Version 1.0 [ZIP] First release version of Half-Life Anti-Climax. Please refer to the description below for the installation guide. 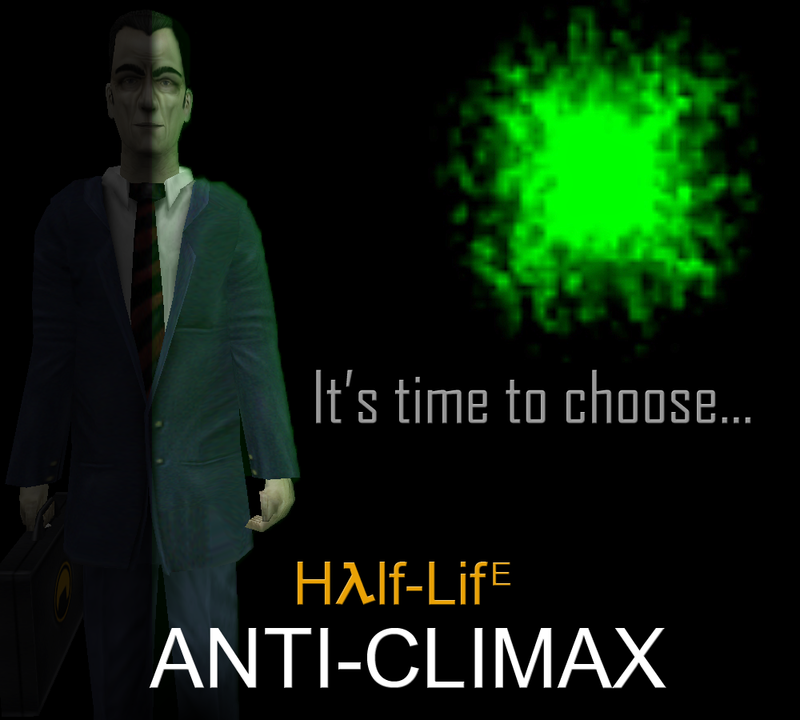 Unzip the contents to the Half-Life folder: ../steam/steamapps/common/Half-Life/. Restart Steam and the game should be available in your list. Just beat it, pretty good, I would love to see somebody use these higher map textures for a texture pack for HL(and expansions). I'm gonna play it now! When I start a new game it gives me the error "ED_Alloc: no free edicts". Any help? Time to give this a shot :) will post a review once i'm done playing it. Nice work. I am so excited! I can't wait to play this. Great Mod ! Just one question : Did you seriously manage to get the good ending on very hard yourself ????? If so....HOW THE **** ?! hey wo soll das gehen? Fehler ED_Alloc: no free edicts. Kannst ja mal bitte erklären, wo man eine neue engine version herbekommt. 2 Wo soll die Verknüpfung sein,habe es probiert : -game anticlimax -num_edicts 2048. Dann kam server not Found. Tut mir echt leid schlechte Arbeit, Mod ist Tot funktioniert nicht. Wäre super, wenn dein Mod selber eine Exe datei hat, nicht mal das ist der Fall. korregiere den Fehler, das man sich auch mal über was freuen, kann und nicht noch zusätzliche Arbeit oder Ärger hat. Keine Ahnung welche Version du denn jetzt benutzt, aber wenn du die aktuelle Steam Version gebrauchst und den MOD dann innerhalb Steam startest, sollte es funktionieren. Wenn es nicht in deiner Spielliste auftaucht, hast du die zip Datei nicht an der richtigen Stelle entfaltet. Been looking forward to this. Nicely done mod, uploaded a playthrough of it (without the secret) on YouTube. Gonna write up a review too.